Astrobiologist Tori Hoehler, a senior research scientist at NASA's Ames Research Center in Moffett Field, Calif., who was not involved in the new study, provided an outside perspective on its implications for life. Europa's liquid water ocean "meets one of the critical requirements for life," Hoehler said, noting that its ocean chemistry is believed to be suitable for sustaining living things. "And what you're hearing about today from Britney bears on a second crucial requirement, and that is the requirement for energy." The genesis of life on Earth is thought to have required some sort of injection of energy into the ocean — perhaps from a lightning strike. And during the 3.8 billion years since then, life's existence has depended on the continuous influx of energy from the sun. Cut off from the sun, Europa's subterranean ocean would need some other energy source to sustain life. Hoehler said spacecraft observations show that there is a huge amount of stored energy in Europa's mineral-rich crust, but it is separated from the liquid ocean below by at least 6 miles (10 km) of ice. Like the two terminals of a battery, energy can flow from the surface material to the ocean only if the two are somehow connected, he said. "What you're hearing about here today would be a way to take this surface material, transport it potentially down into the ocean and in essence tap Europa's battery. When you tap that battery, you move from a system which checks one of the requirements for life to a system that checks a second critical requirement for life, and I think this really impacts the way we consider habitability on Europa." Europan life isn't a done deal just yet, though. Water and energy aren't the only ingredients on the checklist for life, and scientists aren't sure whether Europa has the others, such as the necessary organic chemicals. 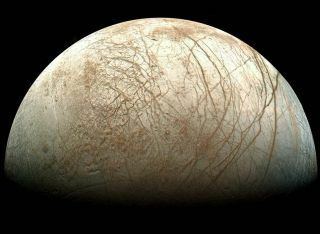 Louise Prockter, a planetary scientist at the Johns Hopkins University Applied Physics Laboratory in Laurel, Md., said Europa's chaos regions "are going to be extremely important and possible future targets of exploration."